DRONES are getting ever smaller. 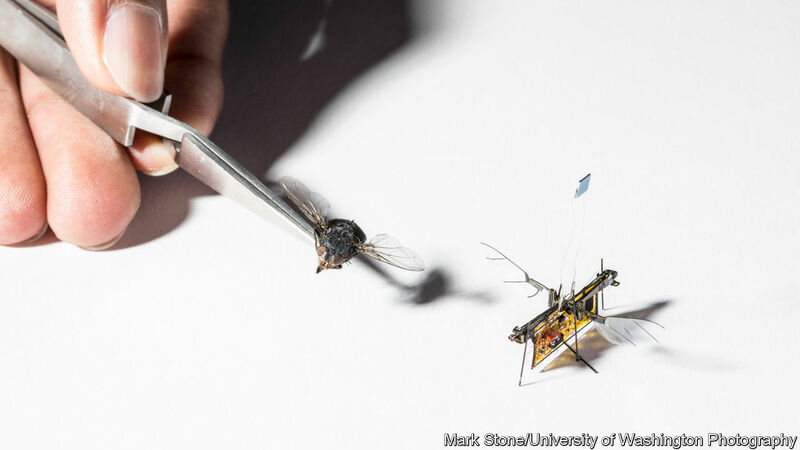 The latest is the first insect-sized robot to take to the air without a tether delivering its power. To get their device aloft, Sawyer Fuller of the University of Washington, in Seattle, and his colleagues, who will be presenting their work at the International Conference on Robotics and Automation in Brisbane later this month, had to overcome three obstacles. One is that the propellers and rotors used to lift conventional aircraft are not effective at small scales, where the viscosity of air is a problem. A second is that making circuitry and motors light enough for a robot to get airborne is hard. The third is that even the best existing batteries are too heavy to power such devices. Nature’s portable power supply, fat, packs some 20 times more energy per gram than a battery can.